Yamraj has always been a fascinating character, much different from the rest of the Gods and Deities. 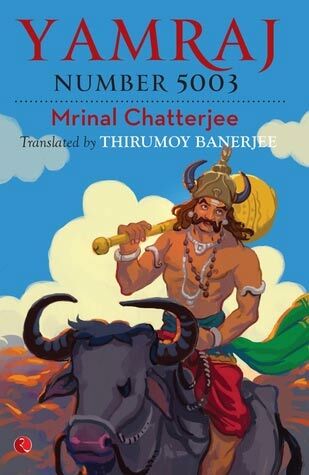 This book Yamraj number 5003 presents a very unique perspective into the popular belief of Yamraj and Yamdoots as soul takes/transporters or whatever you want to call them. It’s certainly a food for thought, how this soul business works and author of the book, Mrinal Chatterjee has hit the right note. The book itself is very slim and you can actually read it in a couple of hours to a few hours, depending on your speed. The author’s writing style is clever, humorous, and innovative. Really enjoyed reading through its pages. As you dive deeper into the book you’d enjoy even more. However, what I disliked about Yamraj number 5003 was that in the intial few chapters it gets a little too descriptive with storyline barely progressing through. So, as the blurb goes. Quite interesting, isn’t it? It gets even better when the trinity of Brahma, Vishnu and Maheshwar decides to go against him. Basically, the author has decided to mix science with mythology. Since, Yamraj alone cannot come down to several places on Earth and take all the dying souls by himself, well, the work is distributed among several clones of Yamraj. And, when humans are still struggling to get their clones right, who makes these clones among the Gods? None other than the creator of Universe, Lord Brahma. Any story where Brahma and Vishnu are involved is incomplete without Narada Muni. In fact, the whole story revolves around a mischief/a curious mistake of Narada. And what’s the result? We get an emotional, poetic clone of Yamraj. A Yamraj clone with a manufacturing defect. So, what would happen when such a clone of Yamraj comes down to Earth to take away the soul of a young girl, while her desperate lover is sitting beside her attending to an injured beloved. Well, that’s the story! Such intense and beautiful words in the middle of a crisp, hilarious ride. Writing style is great. Although, at some place I felt that it could have been better. The prose gets weaker and ordinary. Whether it’s a result of being lost in translation, I couldn’t tell since I haven’t read the original Odia bestseller. Another thing I disliked about the novella was that it was hard to get connected to the characters. Character build up consisted chiefly of covering background stories, rather than the ongoing development of characters. Being a very short spanned storyline, it was bound to happen though. Still I would have loved if more time was spent on characters than on settings, and we could have experienced a little emotional connection with them. I liked the characters Subrata and the duo of Habul and Babul, if only a little bit. Even though the book was thin, could be completed in a very short time, the pace of the narration was a slight hindrance to it. It got too descriptive often diverting the attention from the main storyline. I would have preferred if the description was a part of the storyline instead of separate chapters. Lastly, the resolution of the book. A little sad, was it? Overall, a nice, quick, witty read that you can read on the go. I would recommend this book for the fans of mythological fiction, especially those into Indian mythology.